Fermilab offers a variety of tour programs for the public. Please read below to find the best tour option(s) for you or your group. We have separate programs for K-8 field trips, high school tours, and Scout groups; please use those pages for registration. Come learn why Fermilab is America's premier particle physics laboratory and the accelerator-based neutrino research capital of the world! Fermilab offers "Get to Know" tours to people ages 10 and older. Children ages 10 to 13 must be accompanied by an adult. Summer Sunday tours are the only "Get to Know" tours requiring registration. Get to Know Fermilab tours are held on Wednesdays at 10:00. Please note: Beginning May 6, 2019, Get to Know Fermilab tours will be held on Mondays year-round (except holidays) starting at 1:00 PM. The final Wednesday tour will be held on May 1, 2019. Tours last approximately 90 minutes. No registration is required. Arrive at least 15 minutes early; parking is limited. Tours depart from the north end of the Wilson Hall atrium. You are welcome to eat lunch in the Fermilab Cafeteria before the tour. Summer Sunday tours are held on the third Sunday of May, June, July, and August from 1:003:00 PM. Space is limited; registration is required. Tours depart from the north end of the Wilson Hall atrium. Check the calendar for dates and registration. The cafeteria is closed on Sundays. Lunch is not available on site. 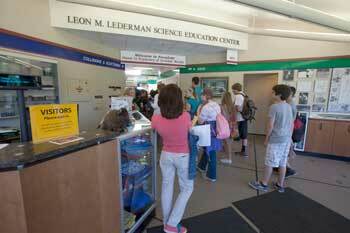 Get to Know the Lederman Science Center tours are held the first Saturday of the month from 10:00 AM to noon. Families meet a docent at the center for a guided tour of exhibits that explore Fermilab science from a kid's point of view. Every first Sunday of the month, Fermilab offers a tour and Q&A session after a lecture. View complete details here. A Spanish version of Ask-a-Scientist (Pregunte a un Científico) is available twice a year. On the first Tuesday of the month at 1:30 PM, Fermilab offers a tour of the DZero detector, experiment and Tevatron for ages 14 and older. (These tours may be moved back a week if the regular day falls on a holiday.) View complete details here. Fermilab's exhibit and viewing areas on the 15th floor of Wilson Hall are open Monday-Friday from 8:00 AM to 4:30 PM and Saturday and Sunday from 9:00 AM to 3:00 PM Just sign in at the reception desk in the Wilson Hall atrium. You also can explore the public-access portion of Fermilab's natural areas via car, bike and on foot during the site's opening hours. You can also enjoy our GPS-enabled driving tour; learn more on this page. There is a minimum of 10 people for a private tour. Tours are by appointment and must be arranged at least three weeks in advance. Please fill out a Private Tour Request Form. A tour begins in Wilson Hall. Visitors view Fermilab from the 15th floor windows and visit various displays located there. The tour moves to the Linear Accelerator building where visitors see the pre-accelerator, linear accelerator (Linac) gallery, and Main Control Room areas. There is a docent for every 20 people with a charge of $50 per group.